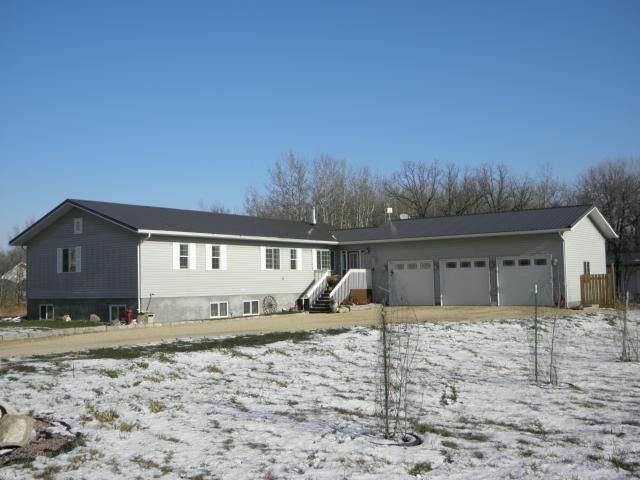 Country living nearest to the city - 15mins to Winnipeg, this wonderful home will serve as your personal retreat. Open concept kitchen with tons of natural light gives onto the formal dining room. Gleaming hardwood floors on the main level with new kitchen cabinetry and granite countertops. Family living room opens onto a wrap around deck with hot tub and private views of the treed rear lot. Over 3300 sq.ft. of living space, nine foot ceilings in the basement, top of the line Geothermal heating system, and infloor heating system throughout the lower level (& rear workshop too). Triple attached garage for all the required toys, and a rear workshop built of ICF (insulated concete forms) with a native insulating value of R50! The basement foundation of the home is ICF as well, and is piled. Quality metal roofing covers the home and workshop, and when visiting the property, the lot goes all the way back to the clearing (not the fence). Worth a look!